After capturing an audience of millions of visitors since its launch in 2013, January 2015 saw the surprise shutdown of Sweden-based streaming site Dreamfilm. One of its administrators was detained by the authorities so, in response, the extremely successful site decided to call it quits. As the case against the site rolled on, four men – aged in their 20s and 30s – eventually had their day in court. While they admitted being involved in the site, none admitted any wrongdoing. In 2017, however, the Linköping District Court found them all guilty of copyright infringement offenses and sentenced them to between six to 10 months in jail. They were also ordered to pay a fine of SEK 1,000,0000 (US$110,850) to plaintiffs including the Swedish Film Industry, Nordisk Film, and Walt Disney. As soon became clear, neither side was happy with the result. The defense felt the sentences were too harsh and, of course, the prosecution felt they were too lenient. The case then went to appeal. Early 2018, the Court of Appeal handed down its decision. Importantly, it was decided there would be no terms of imprisonment to be served due to the previous good character of the defendants. However, it more than quadrupled the damages from SEK 1,000,000 to SEK 4,250,000 (US$471,112). This damages award, the Court of Appeal ruled, was the amount a hypothetical license to distribute a single sample movie would have cost, had the defendants obtained permission. Last year it was reported that two of the defendants would take their case to the Supreme Court with a request to determine whether the level of damages could be considered sensible and fair. The Court has now delivered its verdict and it’s good news for the former site operators. In a summary published this week, the Supreme Court notes that copyright holders are entitled to compensation when people exploit their content. The cost of doing so is usually based on the going rate when someone requests permission beforehand. However, in the case of pirate sites, there is no going rate, since such platforms don’t ask permission to exploit and would probably be declined, even if they did. 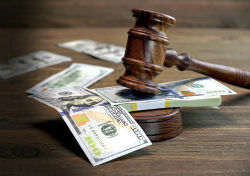 As a result, the Court has the task of determining a fair rate of compensation. “The Supreme Court has come to the conclusion that it is conceivable to point out that a license agreement could have been met between a rightsholder and someone who wanted to use the work in the way that has also happened in the present case,” the Court writes. In the end, the Supreme Court decided that it could not use the method offered by the Swedish Film Industry to determine “reasonable remuneration” for the one sample movie dealt with in detail during the case. It, therefore, decided to massively slash the SEK 4,250,000 (US$471,112) award to just SEK 400,000 (US$44,340). Local anti-piracy group Rights Alliance did not welcome the news. “This is a very significant claim and only applies to one of the total 950 films in the case. In fact, however, the judgment is wrong because it means that it is cheaper to illegally steal a copyright than to try to negotiate legally,” says Henrik Pontén of Rights Alliance.